Getting back to my conquest of as many Belgian styled beers as I can get my hands on (and trying to clear the bombers out of the fridge to make the wife happy) I’m gleeful to review this beer. Pours a vivid color which is a mixture of orange and honey. It’s a very bright beer that seems to glow from the inside, pretty cool looking. Very thin layer of white head which dissipated quickly. The smell that comes to my nose is heavy on honey and citrus with hints of malt. It’s got a nice smooth taste that is a bit sweet and very complex. Tiny bit of hop bitterness mixed in with various fruity flavors, a few spices, and a small dose of honey. The 9% strength is barely noticeable. A truly delightful flavor that rivals many of the flavors straight from Belgium. The mouth feel is light with mild carbonation and has some lingering attributes. This is an amazing world class beer that, as I said earlier, rivals any Belgian or Belgian-wannabe out there. I regret having let this sit in my fridge for a month it also saddens me that I’ve never seen this in the area, I scored it in the suburbs of Atlanta. Luckily I got a bomber so I have another glass and a half! This is without a doubt a 5/5 rated beer. I agree in full. 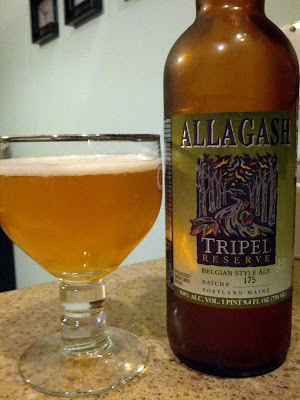 It’s by far one of the best tripels brewed in the US and I wish it was locally available. Next Next post: Two limited beer reviews plus one brand new Cincinnati tour!